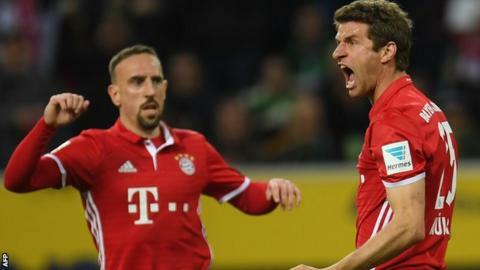 Thomas Muller's second-half goal sent Bayern Munich 13 points clear at the top of the Bundesliga as they beat Borussia Monchengladbach. Second-placed RB Leipzig's 3-0 defeat at Werder Bremen on Saturday gave Bayern the chance to extend their lead. But Carlo Ancelotti's side made hard work of it despite dominating possession, with Arjen Robben hitting the post in the first half. Muller drove in from Thiago Alcantara's chip midway through the second half. The goal, Muller's second in the Bundesliga this season, kept Bayern on course for a fifth successive league title. Bayern were not at their best, with top scorer Robert Lewandowski heading over from Muller's cross early on, and skewing a shot wide when well placed after half-time. Ancelotti's side eased off after taking the lead, and might have paid for that, with Javi Martinez almost turning Thorgan Hazard's cross into his own net, and making a vital block to deny Josip Drmic. In Sunday's other Bundesliga game, Schalke moved up to ninth with a 1-0 win at Mainz, secured by Sead Kolasinac's goal five minutes into the second half. Match ends, Borussia Mönchengladbach 0, FC Bayern München 1. Second Half ends, Borussia Mönchengladbach 0, FC Bayern München 1. Attempt blocked. Raffael (Borussia Mönchengladbach) right footed shot from the right side of the box is blocked. Assisted by Thorgan Hazard. Attempt missed. Tobias Strobl (Borussia Mönchengladbach) header from the centre of the box is close, but misses the top left corner. Assisted by Raffael following a set piece situation. Raffael (Borussia Mönchengladbach) wins a free kick in the attacking half. Javi Martínez (FC Bayern München) is shown the yellow card. Substitution, FC Bayern München. Renato Sanches replaces Arjen Robben. Offside, FC Bayern München. Arjen Robben tries a through ball, but Thomas Müller is caught offside. Corner, Borussia Mönchengladbach. Conceded by Joshua Kimmich. Attempt blocked. Raffael (Borussia Mönchengladbach) right footed shot from the centre of the box is blocked. Assisted by Josip Drmic. Attempt blocked. Josip Drmic (Borussia Mönchengladbach) right footed shot from the right side of the box is blocked. Assisted by Thorgan Hazard. Substitution, Borussia Mönchengladbach. László Bénes replaces André Hahn. Attempt missed. Andreas Christensen (Borussia Mönchengladbach) header from the centre of the box misses to the right. Assisted by Thorgan Hazard with a cross following a corner. Corner, Borussia Mönchengladbach. Conceded by Javi Martínez. Corner, FC Bayern München. Conceded by Andreas Christensen. Attempt blocked. Robert Lewandowski (FC Bayern München) left footed shot from outside the box is blocked. Assisted by Joshua Kimmich. Substitution, FC Bayern München. Joshua Kimmich replaces Xabi Alonso. Attempt saved. Thorgan Hazard (Borussia Mönchengladbach) left footed shot from the right side of the box is saved in the bottom right corner. Attempt missed. Thiago Alcántara (FC Bayern München) right footed shot from outside the box is high and wide to the right. Assisted by Kingsley Coman. Corner, Borussia Mönchengladbach. Conceded by Mats Hummels. Substitution, Borussia Mönchengladbach. Josip Drmic replaces Tony Jantschke. Attempt saved. Arjen Robben (FC Bayern München) left footed shot from the left side of the box is saved in the top right corner. Assisted by Franck Ribéry. Andreas Christensen (Borussia Mönchengladbach) wins a free kick in the defensive half. Foul by Andreas Christensen (Borussia Mönchengladbach). Substitution, Borussia Mönchengladbach. Thorgan Hazard replaces Patrick Herrmann.